Rodents have adapted easily to a life with people. In fact, worldwide, rodents damage or destroy up to 25 percent of all agricultural crops produced yearly through consumption or contamination. Losses attributed to mice are more widespread than simply crop destruction. Rodents are known vectors of disease and are known to gnaw and destroy many items ranging from family heirlooms to expensive electronics and machinery. All these facts combined have made rodents the no. 1 “called upon” pest in the United States. At Pest Solutions 365, we focus on several fundamental techniques for stopping rodents before they invade your home, such as exclusion, trapping and baiting. 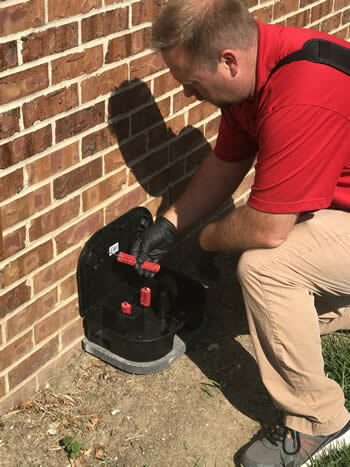 With each service to your home or business, our highly trained technicians inspect your foundation for possible pest entry points. When found, they are repaired. If the entry point is too large for our technicians to seal, Pest Solutions 365 staff stands ready to help. In addition, our exterior monitoring and baiting units have proven extremely effective in reducing rodent populations before they become an issue inside. Call Pest Solutions 365 today for a professional rodent control inspection and estimate. Only $25 for a 20-minute inspection.